In this episode, Deep Ones summon Kari to the Dark Ocean to make her their queen in order to fight Cthulhu. Instead, she and TK put the “love” in Lovecraft. When you let the head writer of Serial Experiments Lain pen a single episode, what did you think was going to happen? This is a truly mind-blowing episode, partially because it is outstanding and partially because it actually may make your head explode. Especially if you're a TK/Kari shipper. The first act even feels like an episode of Lain. Kari's in a major funk, startled by even little things like TK calling her name. While the blackboard doesn't start melting on her, she senses the classroom getting foggy and a pool of water at her feet. Then she nearly passes out. The walk to the nurse isn't any better as she starts hallucinating, capped by the creepiest damn thing ever watching her by the stairs. It's legitimately horrifying... she doesn't make it to the nurse. When TK finds her outside, she's practically given up fighting these visions. Kari senses that something is calling her and that she won't be able to resist when it finally comes for her. Despite not really knowing what's going on, TK pushes her to fight back, using the money line that he cares too much about her to let her give up. That makes things a bit awkward between them and ends the conversation. This episode is fascinating not only for all the Lovecraft stuff, but because it's the first time we get an earnest picture of the relationship between TK and Kari. As the youngsters in season one and the carry-overs in season two, they're pinned together a lot, but perceptions of what the two really think of each other had been based more on presumption than observation. This episode shows the danger of that, as Kari is just now realizing that she can rely on TK the same way she relies on Tai or Gatomon. 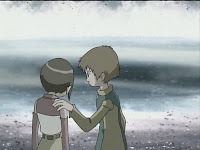 It's certainly a unique relationship between unrelated digidestined, but you do have to ask why she never viewed him this way before all this. Anyways... Lovecraft. 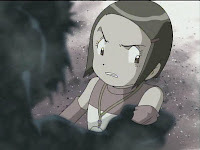 To Gatomon's horror, Kari vanishes out of the blue, arriving in this colorless world with a lighthouse emitting black rays and a vast dark ocean. She feels compelled to enter a creepy tunnel (even acknowledging her own stupidity) and meets up with some Scubamon wearing Dark Spirals. 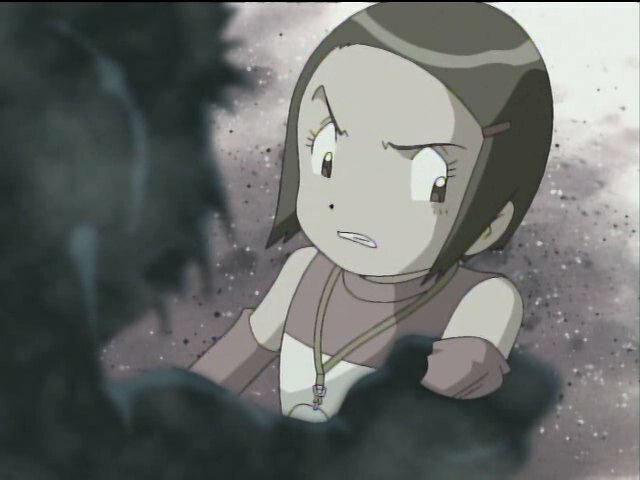 Instead of trying to kill her like spiral-equipped Digimon are supposed to, they beg for her help in removing them. Apparently they were enslaved by the Emperor after being separated from their “undersea master.” Wonder who that could be. Kari somehow seems capable of helping them, but an attack from Airdramon interrupts it. Helpless without Gatomon, Kari uses the power of love (or whatever you want to call it) to summon TK, who has been frantically searching for her. Pegasusmon is able to destroy the control spire, generating a mysterious pink light that lets Gatomon evolve to Angewomon. That light is never explained, but neither is anything else in this episode. Angewomon kills Airdramon- the first legitimate kill this season. She also uses her powers to free the Scubamon. With the spirals off they are exposed not as Digimon, but as full-blown Deep Ones. They promptly do what Deep Ones do best- grab Kari and demand that she be their queen... if you know what I mean. Maybe she shouldn't have ditched that whistle. Angewomon quickly says No Means No and the Deep Ones retreat to the ocean, claiming that their master will rise and come for her. After Kari and TK fly home, we get this awesome silhouette shot of Cthulhu stand-in Dragomon. Surely this new enemy will figure into the equation somehow, rising and tormenting everybody by the end of the season. Sadly... no. Great as the episode is, it's also the biggest cocktease in the franchise. We never see him again. You know what they say- Cthulhu fhtagn. Damn it. The last episode was right in the dub's wheelhouse because of the opportunity for good ad-libs. Strangely, most of the ad-libs here worked really well, particularly the PA announcements and ensuing follow-up jokes. What didn't work was TK and Kari's voice work, which handled the drama with too much intensity and got to be a bit overwrought at times. Contrary to popular belief, Davis, Yolei and Cody are in this episode. Cody actually has a pretty significant moment where he yells at the others to stop being stupid- if they don't know where in the Digital World Kari is, there's no point jumping in blindly. Davis tries to jump into the Digital World blindly, but the system refuses to let him. Why exactly did the system refuse to let him? Same benevolent deity that provided the mysterious pink light I guess. Ken's fleet of Airdramon have appeared in just about every episode so far, but they have never gotten a stat screen identifying them. That's really interesting this time when one was the main adversary. There's this really trippy transition as TK warps to the Dark Ocean. That more than anything should suggest future visits are forthcoming, simply because the animators should want to use that again. Digicode, the written language decorating stat screens, info dumps and other random spots (basically a hiragana equivalent of the alien language from Futurama) hides a couple more Lovecraft easter eggs here. A signpost in the Dark Ocean translates into Innsmouth, a popular hangout for the Deep Ones in the Cthulhu Mythos. In the Japanese version, a block of digicode right before the episode title reads “Ph'nglui mglw'nafh Cthulhu R'lyeh wgah'nagl fhtagn.” Credit to the Digimon Wiki for pointing out those translations... and the poor guy who had to translate that phrase into digicode. did lovecraft write the dub? Yeah, the T.K. and Kari stuff were really cheesy, but that's one of the reasons which made me love this ep. Gatomon say something really deep like "Hope and feelings can connect worlds" before jumping into the portal(?) with T.K. and Patamon. Yet in the dub, she said "Ah, what the heck. I got nine lives". It was strange that since this episode was more on bonds and a little romance, she said something different to the atmosphere. Aside maybe from Myotismon's gate in Adventure, I think this is the first hint in the franchise that not just the digital world can influence the real world. It makes me wonder if Kari's mysterious light power and Ken's dark power might actually originate from a source apart from the digiworld. i guess the reason davis cou;dnt get into the digital world is because the digital world is a takari fan and didnt want davis getting in the way of that. Oddly enough, the one thing that bothered/disturbed me most in this episode was the Airdramon kill (which, by the way, is almost a perfect copy of the LadyDevimon kill from Adventure). It was clearly wearing a Dark Ring, Angewomon easily outclassed it anyway and could presumably pacify it non-lethally, and it didn't die in the Digital World but in another world. So is it a ghost like Wizardmon, and how's it going to fare in a place like the Dark Ocean? I feel a bit sorry for it being one of the few Digimon Emperor servants that got needlessly killed. This episode may have been the biggest cocktease in anime history, but it has provided fuel for more great fanfics than I have fingers and toes. In short: It. Is. AWESOME! Never understood why they'd have this great cliffhanger and then never bring it up again. I must warn. The english dub altered this episode too much. For example in the Japanese version the emperor was really responsible for imprisioning the Dark Sea creatures. 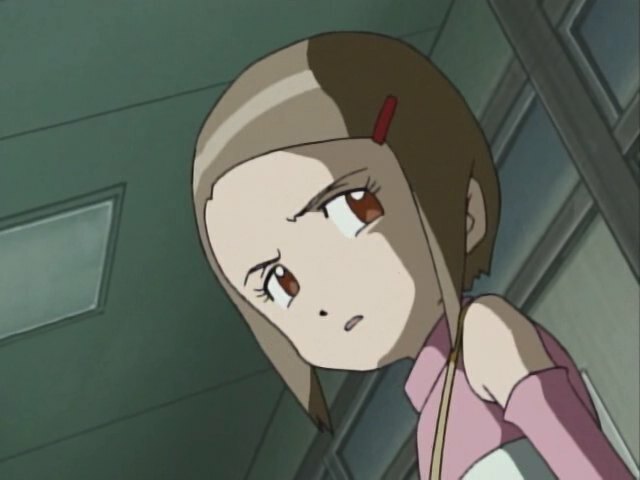 It's hard not to think that TK and Kairi, as veterans of the Digital World that have seen a tonne of Digimon die, care a whole lot less about the no killing rule than the newer Digidestined. Which is scary when you consider that the poor enslaved Airdramon was killed outside of the Digital World, so no Primary Village revival for it.